Fulham boss Felix Magath says he cannot explain their poor start to the Championship season. Supporters called for the German to be sacked after the defeat at Reading, which left them bottom of the table. "I am very sad about our situation so I can understand the fans. Everybody is very disappointed we have only one point," he told BBC London 94.9. "I have never had this in my career before and I would never imagine that such things can happen." Magath was appointed Fulham boss in February, becoming their third manager of last season following the dismissals of Martin Jol and Rene Meulensteen. The 61-year-old, who has had a successful managerial career in Germany - winning the Bundesliga three times - was unable to save the west London club from relegation. Several long-serving and senior players including Brede Hangeland, Damien Duff and Steve Sidwell left Craven Cottage over the summer, with Magath bringing in 14 new faces. But Fulham have struggled to adapt to life in the second tier, losing five of their opening six league games. 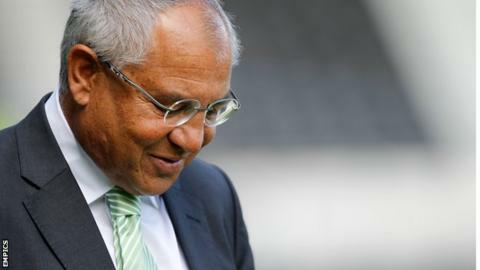 Last month Magath said Fulham were capable of an immediate return to the top flight, but the former Bayern Munich, Schalke and Wolfsburg boss was also embroiled in a newspaper spat with former Whites owner Mohamed Al Fayed over who was to blame for their plight. New signing Matt Smith, who joined from Leeds United on transfer deadline day, was shown a red card for a foul on Hope Akpan midway through the first half against Reading and Magath said his dismissal was a big factor in their 3-0 defeat at their Madejski Stadium. "After the bad beginning of the season and the ending of the transfer period we want to go forward and show everybody we are on the right way," he said. "Unfortunately after 20 minutes the game was changed so much by the sending off of Matt Smith. It was the worst thing that could happen. "At the moment it is a very difficult situation for us. We have to work on it."